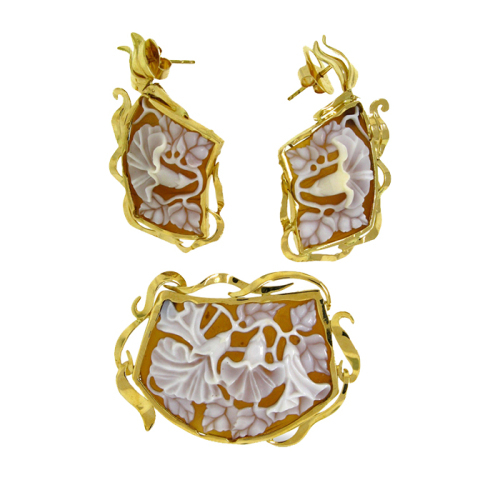 Two hand carved Cameos coupled with a Cameo centerpiece as a pendant set in 18 kt yellow gold. Morning Glory Earrings & Pendant Set. Two 26 mm hand carved cameos coupled with a 42 mm cameo centerpiece as a pendant, set in 18 kt yellow gold. The pendant can be used with a simple ribbon, chain, or small natural cultured pearls that attach with special hooks (available) for a more elegant look. Registry numbers 667/685/670. Sold with a Certificate of Authenticity. Eco-friendly, Fair Trade.